2. Once you downloaded and installed the lauchner you need to login with the Account you just created before. 4. 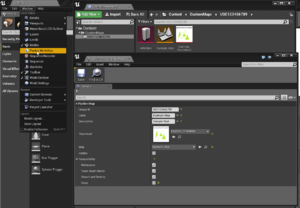 In the Libraries window press the "+ Add Engine Version" and select UE4.21.x and press on the yellow "Install" Button. Specify the installation path and continue. 5. The engine will now download and install. Wait for it to finish and proceed with the next step. 2. Go to your Epic Account connections setting page and fill in your GitHub Account name from the Account you just created. 3. Once the Accounts are linked, you'll recieve an email with a message to "Join Epic Games" on Github. 5. Press the green "Clone or Download" button on the right and then press "Download .zip"
If the link doesn't work and you see an 404 Error, please check your settings on your Epic Account and if you are properly logged in on GitHub with the linked Account. 4. 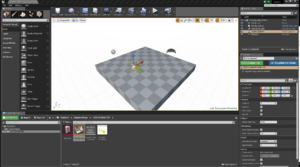 In the UE4 Editor, the first thing you have to do is to go to "Window" and press the "Pavlov Workshop" Button. 5. In the new window, press the "Create New" button once and wait for it to finish. This will create a new and unique UGCXXXXX Folder inside the content\CustomMaps folder. NOTE: ALL Assets need to be inside the UGCXXXXX otherwise those assets will not be visible ingame later on. DO NOT delete or rename this folder. 6. Create a new Level asset somewhere inside the UGCXXXXX folder and save it. 8. You can set a Thumbnail for the map by importing a 512x512px wide Image file. 9. Under Compatibility you can set the gamemodes your map will support. 10. Save the Definition file and you're ready to go. Make sure you followed all the previous steps before doing this. Open the project with the map you want to migrate. Find your Level file in the Contentbrowser and rightclick on it and select "Asset Actions" > "Migrate". You will see a foldertree with all the referenced files of the map. Just press "OK"
A Windows Explorer window will pop up. Select the "Content" folder of your destination Project ( Default path is \Users\*winuser\documents\Unreal Projects ) and press "OK"
Close the Origin Project and open the Pavlov Project you just migrated to. Move the migrated Map file and all the extra folders that came with it somewhere inside the UGCXXXXX folder as its currently outside of it because of the migration from the other project. Rightclick the Content root folder and select "Fix up redirectors" This will clean all redirectors and makes sure your cooked map works properly. Pavlov VR only works with static baked lightning so you have to use a "Directional Light" entity with the "Mobility" set to "Static"
Use a "Skylight" Entity for a realistic outdoor lightning. It also needs to be set to "Static". For a more realistic look and better clarity in VR set the "Indirect Lightning Intensity" to a value between 2-6. You can use as many "Point Lights" and "Spot Lights" as you like, as long as they're set to "static"
To be able to play your map, you need to have valid Spawnpoints. Use the "Pavlov Spawn" Entities from the "All Classes" category on the left in the "Modes" window, or use the searchbar at the top of the "Modes" window. You need to configure them according to the gamemodes you want to support with your map. When using S&D "Special" spawns, make sure to leave some space to the right of it, as the other 4 Players will spawn in a line next to it. Protip: Select a spawn and move it above the position where you like it. Then press "END" to drop it to the floor. This will make sure that you'll spawn correctly ingame without falling trough the floor. To make the Bots move on your map, you need to add a "Nav Mesh Bounds Volume", which you can find under the "Volumes" Category in the "Modes" Window. The Volume needs to cover ALL of the walkable space of your map. Press "P" on your keyboard to get a visual representation of the Navigation Mesh. The green area represents the walkable space for the Bots. DO NOT make ANY changes to the settings of the volume in the "Details" window, since this will cause the Bots to not move at all. To connect areas that don't connect to eachother but are wide enough to fit a player, you can use a "Nav Link Proxy"
Drag a "Nav Link Proxy" from the "All Classes" category in your map. The Proxy has two beacons that need to touch the green area of the Nav Mesh. Press "P" to see the bounds and the connection indicator. Align the two beacons so they connect the two Nav Mesh areas. This way you can link a narrow doorway that won't connect to the Nav Mesh. You can change the Nav Link to be one way by changing the "Link Direction" setting in the "Details" window. Reflection Captures are needed to have realistic reflections on all surfaces that are inside the reflection volume. There are 2 Types of Reflection Captures avaiable. 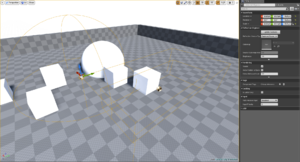 "Box-" and "Sphere Reflection Captures". The only difference is the shape, so you can adjust the volumes to your level geometry. Drag and Drop them into your Level from the "Visual Effects" Category of the "Modes" window. Adjust the size to the aproximate size of your room on eye level. Search & Destroy maps need at least one bombspot. You can have up to 2 seperate bombspots ( A and B ) But you can have as many Bomb Placement Spots for the two Spots. Drag the "Pavlov Bomb Spot" from the "All Classes" category on the left in the "Modes" window into you map. By default the Bombspots will be treated as bombspot "A". To change it, simply tick the checkbox "Is B". Apart from regular walls, sometimes you want to use a "Invisible Wall" for blocking access to a certain area of the map. To create a "Invisible Wall", drag a "Blocking Volume" from the "Volumes" catergory into your level and scale it to your liking. The Geometry Editing Tool can also be used on this volume to easily adjust it to your Level Geometry. Use Blocking Volumes as a ramp over staris to prevent the VR camera from aggressively hopping when walking up stairs. You can also use them for Smoothing out narrow and busy areas to prevent getting stuck and assure smooth gameplay. Put a "Pavlov Kill Volume" about 1000 - 2000 units under your map, that is a bit bigger than your playspace. This will kill players that somehow fell out of the map or gliched out of it. Since the latest github update (1.1), Davevillz added a new actor called Pavlov Game Logic. You must add this to your level or the map will not show up ingame. Once you placed the actor in your level, you have to assign the definition file you created before. Since the 1.1 update, you're able to have vertical ladders in your level. Basicly you just drag the Pavlov Ladder actor and place the edge of the ladder against an object ie. a vertical or angled ladder. A tip: you can use the Geometry Editing (Shift+5) to edit it more easily. To enable bullet penetration, you first have to show the Plugin Content. Do this by selecting the View Options in the Content Browser and enabled Show Plugin Content. Next open your material, go into the General tab and select the Phys Material based on the object you're using. There are two options, normal and thin. Thin will be penetrable. Physical materials will also change the physics of the objects so metal sounds like metal, wood sounds like wood. To Test your map, open the "Pavlov Workshop" window by clicking on "Window" > "Pavlov Workshop"
Click on the "Testing" Tab and then press the "Stage" Button and wait for it to finish. This will create a local .pak file in your game folder, so you can load up the map offline for testing. To submit your map, open the "Pavlov Workshop" window by clicking on "Window" > "Pavlov Workshop". Click on the "Deployment" Tab this time and press the "Submit" Button after you typed in some changenotes. By default, the Steam Workshop page is set to "Hidden" ( A orange promt will notify you), visit the Workshop page of your map on steam and set the visibility to "Public". Protip: Add some screenshots to your Steam Workshop Page and choose a Thumbnail that represents the map, as the Thumbnail is used in the map selection screen ingame. To add screenshots, visit your Workshop Page on Steam and click on the "Add/edit images & videos" button on the right. For taking a screenshot: Press F11 (Immersion Mode), press the arrow in the top left and choose "High Resolution Screenshot"
Stop piloting the CameraActor and delete the CameraActor. If you don't do this, your map will not load. If you need further reading, check the pinned messages in the workshop channels at Discord.gg/Pavlov-VR. There's also an Unofficial Pavlov Map Making Guide which may be more wordy, up-to-date, and inaccurate.